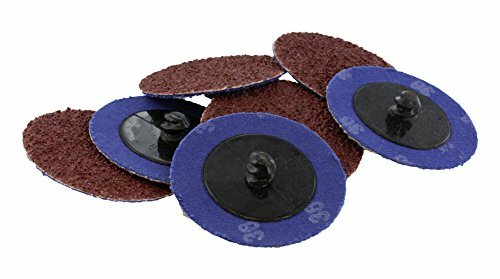 Remove rust, oxides, and coatings and leave a uniform finish on a variety of surfaces with the ABN Aluminum Oxide Roloc Abrasive Sanding Discs 50-Pack, 2" Inch, 36 Grit. These discs are 36-grit, are 2 inches in diameter, and come in a pack of 50. You can use them to sand, cut, clean, and finish a variety of surfaces including wood, plastic, fiberglass, ferrous and non-ferrous metals, and painted surfaces. The 2-inch diameter allows use in hard-to-reach areas, and the strong aluminum oxide discs have a uniform particle size and are bonded with resin that is heat resistant for fast, quality cuts and finishes. The R-type threaded screw backs allow for quick-change and easy attachment and removal on a roloc disc holder mandrel shaft. WARNING: This product can expose you to chemicals which is [are] known to the State of California to cause cancer and birth defects or other reproductive harm. For more information go to www.P65Warnings.ca.gov.